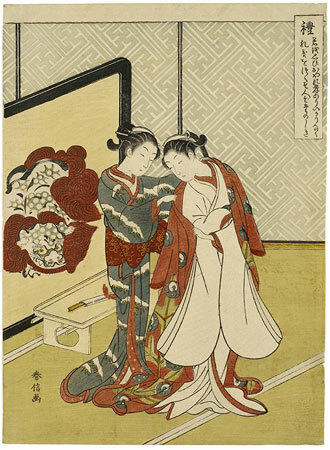 Aside from the calendar prints of 1765 and 1766 few colour prints by Harunobu can be exactly dated. One the following plate from this series, a writing lesson illustrating the virtue of wisdom, a folder of paper is inscribed 9/1767, and in fact this fit falls stylistically between the extreme simplicity of the earliest Harunobu designs and the complex and often mannered compositions of the late 1760s. The series seems to have been popular and was copied twice, once in a smaller chūban format, and once in the upright hosoban format. The copies are unsigned and date from the early 1770s. This print is in remarkably fine condition and is particularly noteworthy for the two patterns of embossing: a diamond pattern on white on the bride’s sleeves and a crepe pattern on her pink overrobe. On the back of the print is a certificates from the Old Prints Society (sic), Tōkyō (Konishiki-e Shinseikai) numbered 71 and with the hand-stamped red seal of the organization.